Samsung is following up its NVMe successes from 2015 with some fresh blazing-fast M.2 SSDs for storage geeks. 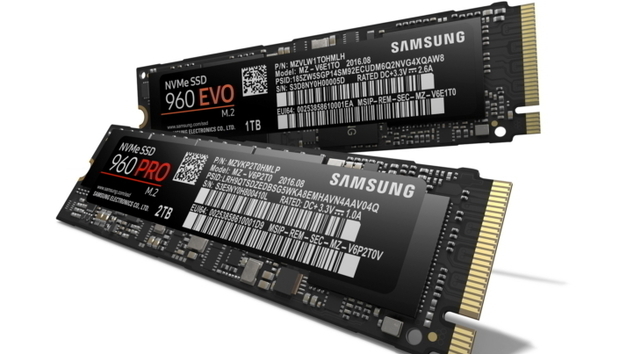 The company just announced the Samsung 960 Pro and 960 Evo during this year’s Samsung SSD Global Summit. As with 2015’s 950 Pro NVMe SSDs, the new 960 series marries stacked V-NAND density with the Non-Volatile Memory express (NVMe) specification. They also use a 4-lane PCIe 3.0 interface, just like the 950 Pro. The 960 Evo and Pro will roll out in October with prices starting at $130 and $330, respectively. The 960 Evo will be available in 250GB, 500GB, and 1TB capacities, while the Pro offers 512GB, 1TB, and 2TB versions. The Evo utilizes cheaper and more tightly packed TLC (triple-level cell) NAND, while the Pro sports speedier MLC (multi-level cell) NAND. That 2TB maximum is double the top capacity Samsung offered with the 950 Pro in 2015, and in another age would’ve earned the moniker “jaw dropping” for packing that much storage into an M.2 SSD. But this is the age of the 1TB SDXC card, so maybe sheer capacity increases aren’t as impressive as they used to be. Seagate also announced a 2TB M.2 storage option for enterprises in July. The 960 Pro offers a nice bump in sequential read/write speeds compared to the 950 Pro. The 960 Pro will have a read speed of 3.5GB/s and a sequential write speed of 2.1GB/s. The 950 Pro, by comparison, topped out its read speed at 2.5GB/s and a write speed of 1.5GB/s. Samsung's promising a sequential read speed of 3.2GB/s and a write speed of 1.9GB/s for the 960 Evo. The 960 Evo will also be the first SSD to come with Samsung Intelligent TurboWrite technology, which the company says helps accelerate sequential read/writes. The 960 Pro comes with a five-year limited warranty or up to 1.2 petabytes written, whichever comes first. The 960 Evo has a three-year warranty or up to 400 terabytes written for the 1TB version. It’s not clear what the guarantees are on the lower capacity 960 Evo models. The impact on you at home: The 960 Pro and 960 Evo “storage sticks” are definitely impressive, as was the 950 Pro that rolled out last year. But unless you have intense storage performance demands, most people will be suitably impressed by going with a standard hard-drive replacement SSD that uses a SATA interface. SSD prices are dropping all the time and SATA-based SSDs are still noticeably zippy compared to a pokey spinning hard drive. One of our favorites is Samsung's own 850 Evo ($157.30 for 500GB on Amazon) which offers great performance and capacity at a reasonable price.